Good quality workmanship at sensible prices. Service that can't be beaten. Free Quotes & Advice. Get in Touch! Maintence contracts available for commercial property. Here at Universal Development we pride ourselves on delivering exceptional standards of work, in Gosport and surrounding areas of Hampshire. We are able to provide you with all your property refurbishment needs. We provide a trustworthy service, that you can rely on, time and time again. We are happy to undertake small repairs in the home; to full property refurbishments. We undertake work in many locations including Gosport, Portsmouth, Southampton,West Sussex and the rest of Hampshire. We are home improvement specialists, providing great standards of work to our customers. We work with our clients to create bespoke living spaces. Universal Development is committed to working with its clients throughtout the process of transforming their homes. Our aim, to help you achieve your homes full potential. Whilst building excellent customer rapport we can guide you through the process with our knowledge and experience from planning to completion. 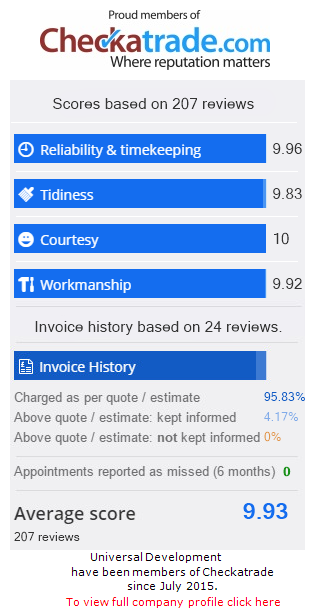 We’ve already helped many customers create what they envisioned with trustworthy, reliable tradesmen’s qualified in plumbing, carpentry, home restoration projects and home renovation projects, in Hampshire and surrounding areas. We also support many local businesses and landlords with our regular maintence contracts. From shop repairs, to end of tenancy refurbishments and hotel maintenance. Whether its a plumber in Eastleigh or a kitchen fitter in Whiteley you can Call us to find out how we can be on hand to help and offer expert advice. Porch converted into a toilet/cloakroom. Removal of old fascias and guttering. Replacing with new.